Welcome to Damon Apodaca Sensei and the members of Santa Fe Budokan, a dojo that recently joined Birankai. D. Apodaca Sensei has practiced Aikido for 45 years, starting with Nakazono Sensei in Santa Fe in 1974 and continuing in with Chiba Sensei at the infamous Fourth Avenue "Pressure Cooker" and University Avenue dojos from 1981-87. Santa Fe Budokan also features the instruction of Kristina Varjan Shihan and Rikko Varjan Sensei and offers classes in Iaido and Zazen. Read more at Birankai Aikido News. Welcome to Santa Fe Budokan! Mark Goudsblom of Aikido Takayama, promoted to Nidan. Congratulations! New York: Instructors Intensive at The Abode in New Lebanon, May 18-20. New York: Memorial seminar for Chiba Sensei with George Lyons, Jenny Flower and Ryugan Savoca at Brooklyn Aikikai, June 1-3. Michigan: Deena Drake at Huron Valley Aikikai, June 9-10. California: Mountain Weapons Seminar with Frank Apodaca at Grass Valley Aikikai, June 23. Utah: Alex Peterson at Salt Creek Aikikai, July 7. All teachers and dojo-cho should be receiving our new "Grow Your Dojo" email with tips and strategies for boosting enrollment, managing a dojo and improving teaching. 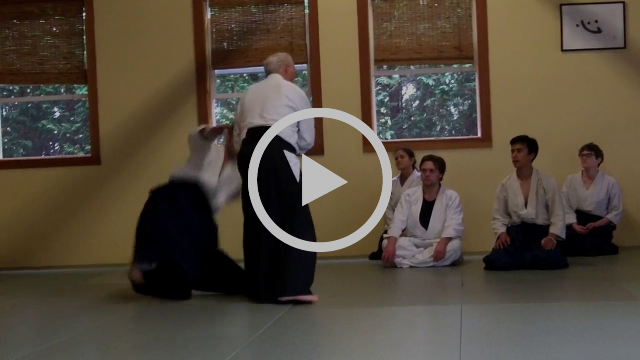 We're also sharing video and discussion on a new Facebook group, Birankai Aikido Teachers. Join us in growing our organization! Great news from the scholarship fund: Proceeds from the 2017 Summer Camp raffle helped 11 Birankai Aikido members from all over North America make it to 2018 Camp. Birankai’s travel grant program is also helping defray airfare costs for 30 people this year coming to Summer Camp from afar, almost double the number helped last year. Our travel offset program is just two years old. Come one come all! Register Now: It’s not too late to register for 2018 Summer Camp in Tacoma – this year’s event is really shaping up to be a great one, but could be even better with you on the mat! Registration is open through June 4th, and rooms are still available in the dorms if you’d like to be a resident. Go to the 2018 Birankai Summer Camp website for more info, or register now on the registration site. Summer Camp questions? Feel free to contact us at birankai@gmail.com or call 503-683-2454. Airport rides: Don’t forget to check out the RideShare Connector tool to find an old friend or make a new one for travel between SeaTac airport and the University of Puget Sound campus. Check out the action-packed T-shirt design for 2018 Summer Camp! Go to the order form to choose your size and color, and grab a few for other dojo members, friends or family. You need to place a pre-order to guarantee getting a shirt. The extras we bring to camp often go fast and your size can not be guaranteed without a pre-order.No payment due now: Each shirt costs $18 pre-ordered, $20 at camp. This will be payable at camp only, pick up and payment at the camp store. The final day to place your T-shirt order is June 24th. Summer Camp is on the way; give your creative self! Do you have a craft? An unwanted and cherished item? From calligraphy, to teapots, to Pez dispensers, you never know the value of a gift to whomever receives it . With the raffle, everyone wins -- 11 people got scholarships this year through raffle proceeds. Donate through this form and be sure to pre-order tickets. Your prize donation and ticket purchases benefit the Summer Camp Scholarship Fund and the grand prize is a FREE SUMMER CAMP. Darrell Bluhm Shihan of Siskiyou Aikikai worked on blending weapons and body movements earlier this month at Green River Aikido in Greenfield, Mass. Read more about the seminar at Birankai Aikido News.